[Satnews] Joint Functional Component Command for Space, in coordination with U.S. Strategic Command other combatant commands, services and appropriate US government agencies, concluded Exercise GLOBAL THUNDER 16, November 8. GLOBAL THUNDER, which began November 2, is an annual command and control exercise designed to train Department of Defense forces, assess joint operational readiness and validate the command's ability to identify and mitigate attacks across all of USSTRATCOM's mission areas, with a specific focus on cyber, space, missile defense, and nuclear readiness. Planning for GLOBAL THUNDER 16, an exercise based on a notional scenario with fictitious adversaries, has been underway for more than a year. "The security environment is increasingly complex and dynamic. Exercises such as GLOBAL THUNDER hone USSTRATCOM's ability to anticipate change and confront uncertainty with agility and innovation," said Adm. Cecil D. Haney, US Strategic Command commander. "The scope and magnitude of the exercise and the training it provides will ensure that we are prepared to meet future threats whether they be nuclear, cyber or space related." For its part of the exercise, JFCC Space, in conjunction with its subordinate wings, tactically-assigned space units and Allied and commercial partners, demonstrated the ability to fight through a contested, degraded and operationally-limited space environment while delivering synchronized space effects to the joint, coalition warfighter. "I am extremely proud of the team; the mindset they displayed and how they responded to a myriad of challenges which tested the limits of our ability to command and control in a contested, degraded and operationally-limited domain was simply outstanding," said Lt. Gen. David Buck, commander, 14th Air Force (Air Forces Strategic) and JFCC Space. GLOBAL THUNDER 16 also provided opportunities for strengthening existing international partnership as both Canadian and United Kingdom officers integrated and embedded into operations and planning cells at various locations including USSTRATCOM headquarters at Omaha, Nebraska, and the JFCC Space at Vandenberg Air Force Base, California. 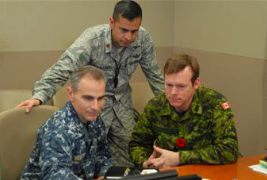 JFCC Space expanded its international cooperation for the exercise as Canadian Armed Forces Brig. Gen. Michel Lalumière, Director General Space, deployed to the Joint Space Operations Center to augment the senior leadership team. "Just as with NORAD/NORTHCOM and numerous other defense efforts, the Canadian military is integrated with our US partners in the collective effort of preserving the safety, security and stability of the space domain," Lalumière said. "Exercises such as these provide an exquisite opportunity to explore, analyze and validate how we pull the sum of our capabilities and expertise to deliver synergized effects for the domain." Rear Adm. Brian Brown, JFCC Space deputy commander, who worked side-by-side with his Canadian counterpart, highlighted the importance of cultivating partnerships within the international community and across the commercial sector. "As space becomes more contested, it is imperative that we work with allies and partners to ensure that we are able to preserve access to space, operate through a potentially degraded space environment, and provide the support necessary to friendly military forces," Brown said. "Acting collectively rather than individually, with increased transparency, can build confidence and provide more effective space-based support for a participating nation's security." "I greatly appreciated the opportunity to work with General Lalumière during the exercise," Buck said, "his perspective was invaluable and his presence speaks to a future of more robust cooperation between our two countries." "We have been making great strides in leveraging partnerships to bolster our ability to protect and defend the space domain," Buck continued. "From the Allied partners on the JSpOC operations floor, to the Commercial Integration Cell which delivers critical situational awareness and expertise from our industry partners, we are aggressively pursuing all available means to preserve the space capabilities which enable both our way of war and our modern way of life."